Sound and Vibration Isolation Curb. ISAT and Kinetics sound and vibration isolation curb. There is NONE BETTER for Engineering services, manufacturing and testing capabilities - all backed by the industry’s most experienced staff. The Kinetics ESSR is the only isolated curb system that addresses all four noise sources associated with packaged rooftop equipment. The ESSR incorporates all the features of our ESR vibration isolation curb with our aerodynamic acoustical silencers; return air plenums and NOISEBLOCK™ STL panels. 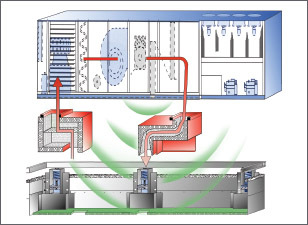 This gives you a noise control system that addresses all the noise and vibration concerns of your packaged rooftop equipment: vibration from the rotating equipment and casing radiation, duct-borne noise from supply and return fans, and breakout noise from the fans and compressors into the space below.